Posted by admin in climate, natural hazards. 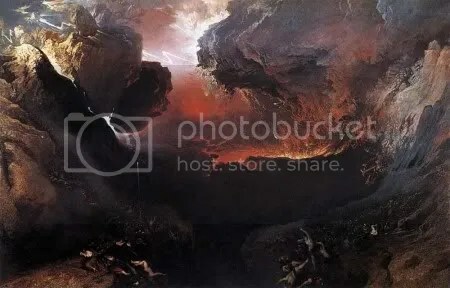 Above: John Martin’s ‘The Great Day of His Wrath’ (1853). An understatement, if anything. Melting glaciers will set off avalanches, floods and mud flows in the Alps and other mountain ranges; torrential rainfall in the UK is likely to cause widespread erosion; while disappearing Greenland and Antarctic ice sheets threaten to let loose underwater landslides, triggering tsunamis that could even strike the seas around Britain. At the same time the disappearance of ice caps will change the pressures acting on the Earth’s crust and set off volcanic eruptions across the globe. The report quotes the reliably apocalyptic head of UCL’s Benfield Hazard Research Centre, Professor Bill McGuire: ‘Not only are the oceans and atmosphere conspiring against us, bringing baking temperatures, more powerful storms and floods, but the crust beneath our feet seems likely to join in too’. I don’t want to condone the anthropomorphic means that Bill McGuire evidently uses to convey the scientific evidence on climate change, but we ARE “looking at a future looking at a future of earthquakes, avalanches, tsunamis, collapsing mountains and more volcanic eruptions” and there is certainly plausible scientific evidence that climate change could be linked to each of these. In fairness, that same statement could also be made without tying it to climate change. What rankles me is the Guardian’s headline which suggests that the Earth is threatened. The Earth will do just fine – it’s humans (and other biota) that may be threatened. Pure Alarmism serving the UN IPCC Agenda to put humanity in “Green Shackles”, in favor of those who seek unlimited political power and unlimited amounts of free money leaving humanity with “death and taxes”. Thanks for publishing this propaganda. Well now, as the world is not warming, the Guardian’s article is good only for use in a privy, as usual! It the UK we should be concerned by ice. not fire. This would be the same Bill McGuire that prophesied a major quake along the Sumatera fault after the 2004 tsunami along the Aus/Indo plate border. The same prophesy that had people in North Sumatera and Aceh terrified for months and months in 2005/06. That would be the same Bill McGuire that studied Krakatau and came up with completely different scientific conclusions to another study that had been done only a year or so earlier by a US team led by a noted vulcanologist whose name escapes me. I would like to suggest that the relationship between geologic events and climates is similar to the relationship between climate and CO2. CO2 levels follow climate shifts. Climate follows geologic events e.g. Tambora. I thought your subtle “apparently” was enough, as I’ve followed your blog for a while, but some folks need bigger signs. Thanks, Mitchel44. Maybe subtlety and the internet just don’t mix. Ron de Haan, you need to read more carefully! You’ve misread the tone of the post completely. One of the reasons I like this blog is precisely because it *doesn’t* justs swallow and regurgitate whatever propaganda is out there. And geology is antural. The Earth cools,warms up and cool down again not in 40 years but 100’s of years. For anyone on Earth it seems like the trend would be never ending but we don’t see things that happen slowly and for a long time that way. We see things happening right now and therefore we miss the big picture. The Benfield center where McGuire works is funded by the insurance industry, so is it surprising he’s ‘reliably apocalyptic’? David Pyle, who has done the work on glacial retreat being related to increased volcanism, is a real scientist whose ideas I would have more time for. The statements actually from him in this article are sound science, but the article frames them in a way that makes them seem supportive of the Guardian’s climate-doom fanaticism. Great title by the way: I will be using the phrase ‘tectonic-volcanic geo-apocalyptic mega-mayhem’ in my everyday conversation from now on.